"Cardinal" Brandmuller warns of Schism: "May God prevent it"
Notice that "Cardinal" Brandmuller brings up schism entirely on his own initiative. The interviewer did not "bait" him to speak about a split in the church. In fact, the questioner seems somewhat incredulous at Brandmuller's comment and therefore asks if he considers schism a genuine possibility. Brandmuller does not say "yes" or "no"; he gives a response that deliberately avoids a direct answer: "May God prevent it." Since the first Synod on the Family in 2014, we've been asking, "How long until schism?" in the Vatian II Sect. Apparently even Novus Ordo cardinals are now asking themselves the same question.To avoid confrontation over Dubia? It doesn't take a rocket scientist to see what's going on here. Francis is running like a chicken from having to respond to the dubia presented to him, which put him in a corner: If he answers them in accordance with the true Catholic Magisterium, then Amoris Laetitia serves no purpose except to confuse and deny that teaching -- his goose would be cooked. On the other hand, if he wants to vindicate and uphold the novelties taught in Amoris Laetitia, then he must directly contradict the true Catholic magisterial teaching -- and again his goose would be cooked. So, it's a no-win situation for him. He can only lose. It is absolutely clear that Francis desires the confusion, the division, and the sacrilege that is the result of the ambiguities of Amoris Laetitia. That's why he wrote the document the way he did in the first place. We would like to encourage everyone reading this post to listen to our latest podcast, a mere eleven minutes in length, which addresses Francis' refusal to grant an audience to the four "dubia cardinals". You won't regret listening: 1 The "operation of error" (2 Thess 2:10) in the Vatican is advancing under Francis like never before: "For such false apostles are deceitful workmen, transforming themselves into the apostles of Christ" (2 Cor 11:14). So now what, you ask? Here's what. And pray unceasingly that God will finally restore Holy Mother Church and bring to an end that abominable Novus Ordo Sect, which we have all deserved on account of our sins. "We do not ... consider the Chair of Peter to be vacant"! Francis: "I may go down in history as the one who split the Catholic Church"! Officially, the conference had the intriguing and yet smooth-sounding title, “Catholic Church, where are you going?” The line-up of speakers included some of the usual suspects as well as a few lesser-known names: “Cardinals” Walter Brandmuller and Raymond Burke of Dubia fame; the ubiquitous Kazakh auxiliary Athanasius Schneider; the atheist philosopher, politician, and Francis critic Marcello Pera; the canonist Valerio Gigliotti; and the bioethicist Renzo Puccetti. The Oct. 28, 2017 edition of the German daily Frankfurter Allgemeine contains a full-page interview with “Cardinal” Walter Brandmuller, one of the only two surviving Novus Ordo cardinals who petitioned Francis to answer five specific questions or doubts (“dubia“) regarding the teaching of his exhortation Amoris Laetitia. Fr. Brandmuller’s responses throughout the interview are refreshingly clear and firm, especially for Novus Ordo standards. 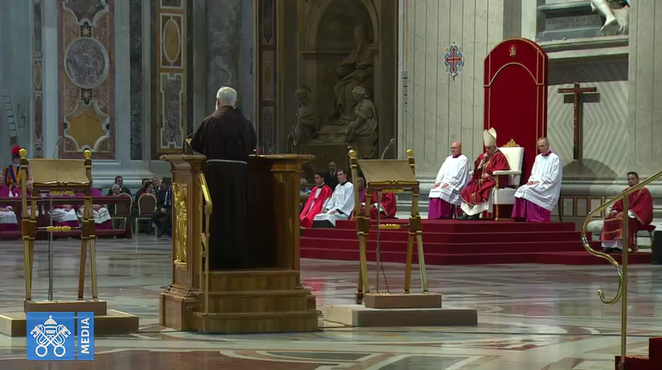 On June 19, it was revealed that Francis has been ignoring the request of “Cardinals” Caffarra, Brandmuller, Meisner, and Burke for a joint audience to resolve apparent contradictions between Francis’ exhortation Amoris Laetitia and the timeless Catholic teaching and practice regarding adultery, the state of grace, and reception of the sacraments. “We do not … consider the Chair of Peter to be vacant“! Today the veteran Vatican journalist Sandro Magister published a bombshell on his blog, Settimo Cielo. It had been mentioned before in the press that the four “dubia cardinals” — Carlo Caffarra, Raymond Burke, Walter Brandmuller, and Joachim Meisner — had requested an audience with “Pope” Francis to discuss with him the concerns they had voiced in their “dubia” (doubts or questions) concerning the “papal” exhortation Amoris Laetitia. Francis: “I may go down in history as the one who split the Church”! Francis: “I may go down in history as the one who split the Catholic Church”! Just a few hours ago, the online edition of the secularist German periodical Der Spiegel published an interesting article on Francis’ explosive Christmas greetings to his curia yesterday and the general atmosphere in the Vatican. The article, penned by Walter Mayr, is entitled, “Der Papst kocht”, which translates as, “The Pope is fuming”, a reference to Edward Pentin’s recent revelation that Francis was “boiling with rage” at the public release of the dubia submitted by “Cardinals” Burke, Brandmüller, Caffarra, and Meisner in November.